In the world of formative learning technology offers possibilities that were never before available. Lessons can be personalized while collecting data for future instruction. These lessons can be created quickly and can even be remixed from ones other educators have created. The teacher can gauge student needs and control the flow and frequency of an activity. Along with lessons, teachers can create their own videos that students can control and adjust to their learning style. In fact, students could even be the author of a video. As we all know, creating content that explains conceptual understanding allows for deeper understanding. Best of all, both the creators and consumers of this information are taking an amazing formative ride. I really do hope you enjoy the tools that I suggest and as always, please let me know if there is a resource I should mention in a future post. Lesson plan tools have been around as long as the one room school house. The first lesson plans were displayed to students on the blackboard as students practiced on the individual slates… possibly the first 1 to 1 environment. Many of today’s teachers started their careers with lesson plan books, hand written, and a guide to instruction. The digital capabilities of the web allow teachers today to build lessons online in minutes. This capability provides teachers the ability to use a multitude of OER (Open Education Resources) and web applications that are bountiful on the internet. Students also have the ability to visit these digital lessons at their own time and pace. Lessons can be built to give feedback as the learning takes place. Best of all, teachers may wish to have students demonstrate learning by building their own lessons or presentations. Some can even be used to jigsaw learning providing student ownership in a needed demonstration or lecture. While an LMS (Learning Management System) can provide some of these capabilities, many of the below tools can be integrated with an LMS. Take a moment and try to learn about at least one of these amazing tools. You might even find some free already built lessons that might fit your classroom style. You will find new ways to get formative. Blendspace – If you have five minutes and an internet connection this tool might be the resource for you and your students. Create a lesson using multiple of resources or tools on the internets. Provide links to your students or embed the lesson into the district LMS (Learning Management System). Gooru – Build wonderful digital lessons in no time. Find a vast collection of already built lessons along with OER (Open Education Resources). Send students to the link or embed in the school LMS. Take advantage of multiple prebuilt lessons that allow for formative learning. Go Class – Edit and manage digital lessons from anywhere for use on any device. Special Show-Explain-Ask interface allows for easy ability to add pictures, multimedia, teacher notes, and formative assessments into the plan. Nearpod – Think of Nearpod as a presentation on multiple devices controlled by the educators. Not only do all students see the same presentation slide at the same time… but can also visit a teacher directed website. It can be an important teaching tool when teachers are trying to ensure each student is immersed in the formative learning process. Imagine students creating and being the presenters! Providing videos to students can be a powerful learning opportunity. Not only do videos provide some engagement because of the multimedia appeal, but students can stop,rewind, and watch again. Screen capture software has gained popularity with the advent of the Flipped Classroom. This type of software allows an educator to record their computer screen while doing a voice over. Now a power point lecture can become a video to be watched anytime and anywhere by students. Other software goes beyond just screen capture and will allow the ability to create animated or drawing over video productions. Not only can educators use these amazing resources, but they can encourage students to do the same. This opens up a whole new array of opportunities. Student could demonstrate learning, or even produce videos helping other students in their understanding of a concept. This concept allows the curriculum to be owned by students and teachers. This provides a different view allowing students to see learning in a formative manner. This approach results in learning improvements for those students viewing the content. The students producing the content also gain a new understanding of not only the content they are delivering, but also by learning the formative steps that occur in learning. Take a look at the below resources and discover how you can provide students formative learning opportunities through both consumption and production of multimedia. Jing – A quick and easy screen capture tool allowing for voice over. Could be used by a teacher to prepare a lesson or by students to demonstrate learning or build content tutorials to help others. Screencast-O-Matic – Another great screen capture system with some advanced editing controls. 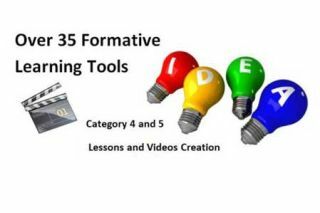 This allows for wonderful possibilities and final video can be shared on You Tube and then integrated with some of the video tools for formative assessment. Powtoons – This tool allows for the creation of some wonderful animations that could explain concept ideas. They are engaging and provide lots of possibilities. Students can even create their own Powtoons opening up even more possibilities for formative learning. Moovly – Do you like the idea of overlaying drawing and animation on real video? This might be the perfect tool to help explain content. Better yet… students can do the explaining and creating as they enjoy using this engaging resource.